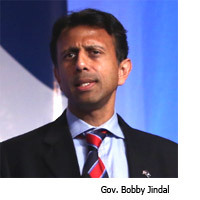 Although corporations are already turning up the heat on Jindal, the Governor says, “They are free to voice their opinions, but they will not deter me.” Realizing that this is a watershed moment for religious liberty, Jindal writes, “Liberals have decided that if they can’t win at the ballot box, they will win in the boardroom. It’s a deliberate strategy. And it’s time for corporate America to make a decision. Those who believe in freedom must stick together: If it’s not freedom for all, it’s not freedom at all.” With the Left’s attack dogs on the loose in Louisiana and elsewhere, religious liberty is almost certainly going to be a major issue in 2016 — in more ways than one. While conservatives scratch and claw for their right to exercise the same tolerance the Left enjoys, leaders like Speaker Boehner have their eyes on the global crisis. Religious liberty is at the center of ISIS’s storm, as dozens of innocents are slaughtered for the faith our country is so reluctant to protect. In a new blog post, the Speaker’s office catalogues the latest horrors, and asks: Is the Obama administration doing “all it can” to protect Christians all over the world? Even small gestures, like appointing Special Envoy to Promote Religious Freedom, have gone unfulfilled.